Police had first resorted to lathicharge to disperse the rioters and then lobbed teargas shells. A DAY after Dalits were attacked in Samter village of Una taluka in Gir Somnath district, police arrested 20 persons and detained six others Tuesday. According to police, a mob of around 1,000 persons had blocked National Highway 8E at Samter village Monday evening when Dalits were returning after participating in Dalit Asmita Yatra in Una town. The mob threw stones on police and Dalits, injuring many. Police had first resorted to lathicharge to disperse the rioters and then lobbed teargas shells. But as the clash continued for about three ours, police fired in the air to quell the mobs. “Seven policemen, including Una’s police inspector and Veraval’s DySP, have been injured. We are investigating as to how many Dalits were injured in the violence. We have arrested 20 persons today and detained six others who are injured and are undergoing treatment in hospitals,” said H R Chaudhary, Gir Somnath SP. Chaudhary, however, added that the village was peaceful and no untoward incident was reported from any other part of the district. “State Reserve Police and local police continue to be deployed at Samter. The situation is peaceful,” he said. Based on a complaint filed by Veraval DySP K N Patel, Una police have registered a case of attempt to murder, rioting, assaulting public servant among others, against 37 persons and a mob of 1,000 persons. Meanwhile, doctors at Junagadh civil hospital said that one of the two injured admitted there had sustained bullet injuries. “Jasvantsinh Bhatti, a 20-year-old from Samter village, has a bullet injury in his thigh while Bapubha Gohil, 40, also form Samter, has a broken nose,” said Dr Tansukh Solanki, resident medical officer of Junagadh civil hospital. However, Junagadh range inspector general Brijesh Kumar Jha said it was not certain if the man was hit by police bullet. On Monday, hours after the 10-day Dalit Asmita Yatra ended in Una, tension gripped the area as police fired six rounds in the air at Samter village when a mob began pelting stones to protest the participation of local Dalit residents in the event. At least four police personnel and four others were injured in clashes at the village, about 10 km from Mota Samadhiyala where seven Dalits were flogged by a mob for skinning a dead cow on July 11. CID (crime), which is investigating the flogging case, has arrested 36 persons so far. Majority of those arrested are residents of Samter. Una police inspector H G Vaghela told The Indian Express that he, too, was injured in the stone-pelting, apart from three women police constables. Four FIRs had been lodged at his police station since Sunday night against those either trying to stop Dalits heading to the rally or obstructing police, said Vaghela, who is investigating the case. Prakash Parmar, a Dalit resident of Samter, said over phone: “I have been calling local police for protection but to no avail. Today, they came only after the attack on Dalits returning from the sammelan.” Parmar said that he was a relative of the flogging victims and that his family has been facing threats from upper-caste villagers. “Police fired six rounds in the air at Samter village to disperse the mob,” said Junagadh range IG Brajesh Jha. He said that another village Rameshwar Patiya also witnessed violence. “In both villages, police lobbed more than ten tear gas shells to disperse the mob. The situation is under control and the roads that were blocked due to the violence have been opened,” said Jha. 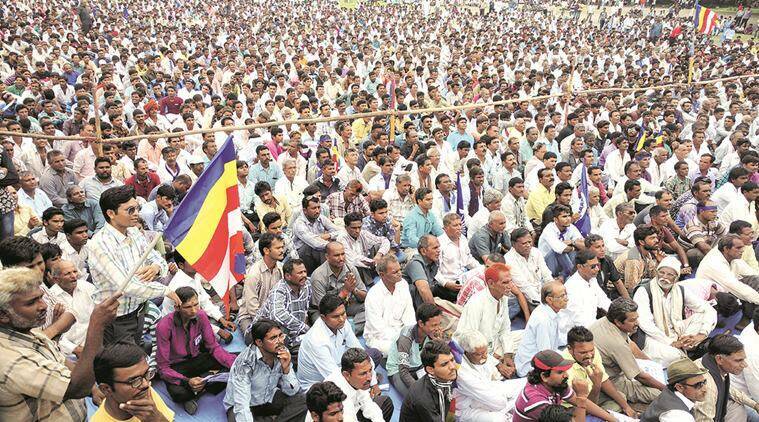 Earlier, the Dalit yatra, which was flagged off from Ahmedabad on August 5, ended with the warning that a “rail roko” agitation will be launched after a month if the Gujarat government did not give five acres of land to each Dalit family as an alternative for the “traditionally imposed dirty jobs” of disposing carcasses and manual scavenging. The warning was issued by emerging Dalit leader Jignesh Mevani in Una while addressing a gathering of around 6,000 people. Kanhaiya Kumar, president of the JNU students union, and Radhika Vemula, the mother of Rohith Vemula, who committed suicide following his ouster from the Hyderabad University hostel, joined the last leg of the yatra.